Now that spring is here, you might be doing a huge spring cleaning like me. I get why spring cleaning is a thing – I’ve been wanting to clear out every cupboard, closet and get rid of all the things! This also means hanging new art on the walls and switching out old prints for new ones. 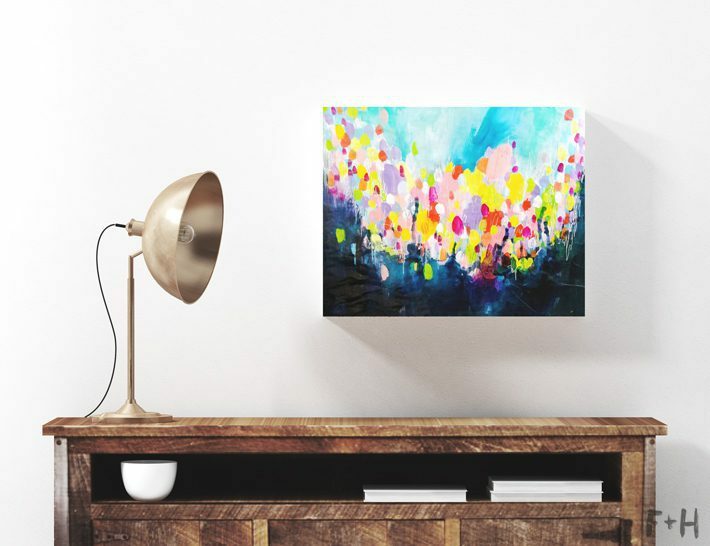 I was inspired to paint this free printable abstract wall art after a long cold winter. It was time for some bright and lovely color around here! 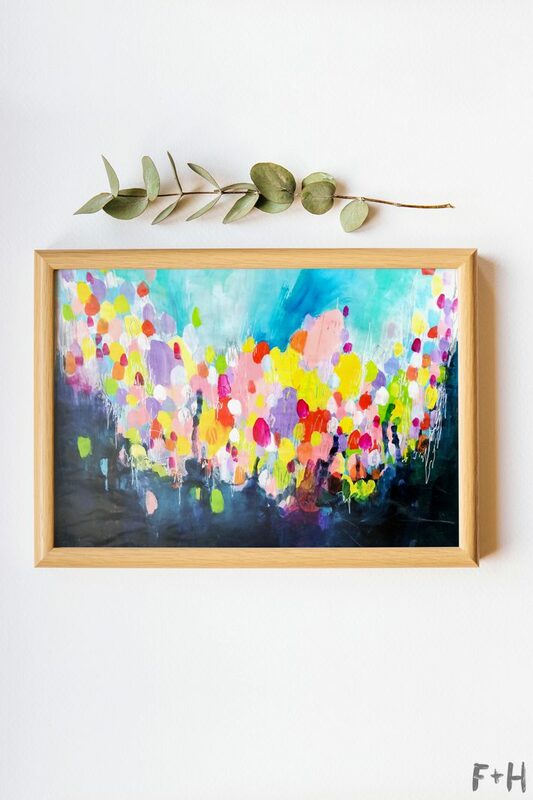 This print would look amazing with my free blue agate wall print or palm leaf art prints. This painting was done with acrylic and pencil on my daughters’ art easel pad! Further proof that you don’t always need the nicest or fanciest art supplies to make something. The original is actually about 16″x20″ in size, but unfortunately I don’t have a camera that shoots high enough resolution to make it print that large. 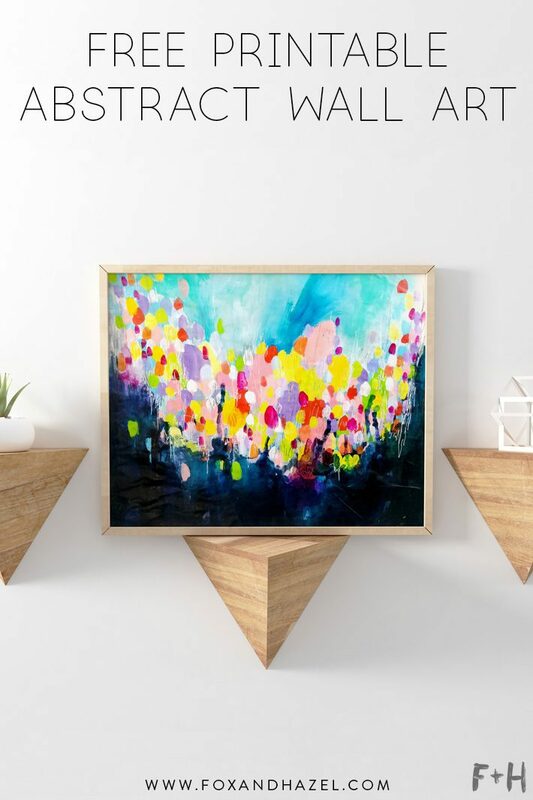 Maybe this free printable abstract wall art will eventually be that big when the gods smile on me and I can upgrade my camera! The contrast of bright colors with the dark bottom just feels electric and powerful to me! If you’ve been a fan of the blog for a while, then you’ll know that I love bright, bold and high contrast artwork. Subtlety is not my thing, haha. Especially in my art journals – they’re bursting with color all the time. These files are for Personal Use Only and copyright lays with Fox + Hazel. Please do not distribute these files via email or blog. Instead, link back to this post. If you love this freebie, you can say thanks in one of these ways! Do you love art supplies too? Come check out all my favourite art supplies, recommendations and more! Thank You So Much for this amazing work!